Another day on the whole30 challenge and we woke up to another beautiful morning in the Sierra Nevadas. I woke up feeling refreshed and rested, which was really nice. I sat in bed and read “It Starts With Food” for a bit while I waited for everyone to wake up. This is different because normally I’m the one sleeping in while everyone is waiting for me! 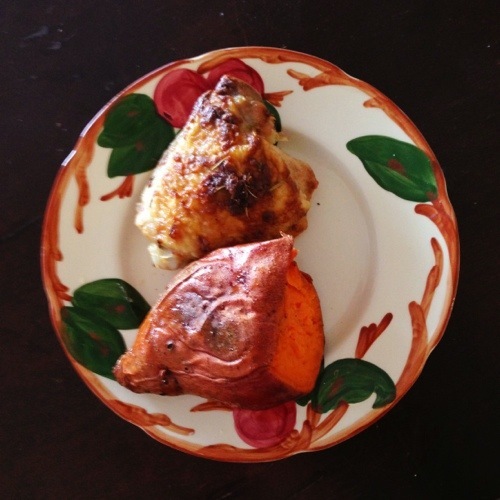 For breakfast I had a mustard chicken thigh and sweet potato that I cooked on Friday before we left home. Yes, I had lunch and dinner foods for breakfast. So what. They are good and healthy and provide me with fuel which is what food is for. It’s not about sugary cereals and breaded pastries. I learned a lot about this over the past 9 months while becoming gluten-free and now it’s becoming cemented in my head during whole30. I am becoming reprogrammed! 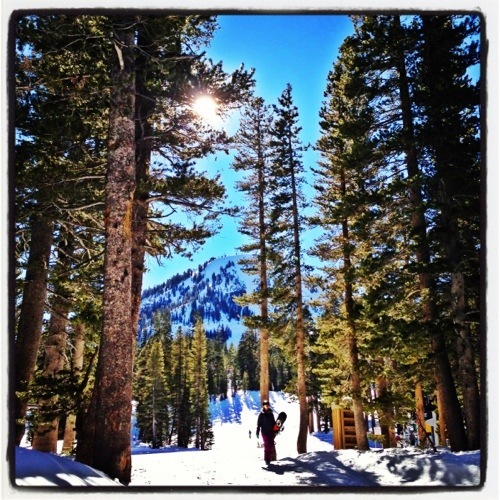 We snowboarded for several hours and then hit the road. It’s a long drive home back to LA. We decided to stop for food in Bishop, CA. I had a bit of a sweet potato left but most of my “protein” was gone. There was a BBQ restaurant and we went there. They had all different types of meats. I asked them what they cook their meat in and they said it is just smoked with spices. Hmm. This seems Whole30 compliant. I ordered the tri tip but I ordered it dry because all the sauces were not whole30 compliant. I also didn’t get a side because all the sides were not whole30 friendly. I ate my 1/2 sweet potato as my own personal side and ate the tri tip. It was actually really good dry and I enjoyed it a lot. I did want to put hot sauce on it but the hot sauce had brown sugar and corn syrup in it. Yes, I asked. I am blown away at how often sugar and corn syrup is hidden in food and we don’t even realize it. Makes me sad. After we had BBQ we continued on our journey back to LA. When we got home we were very tired. I had some kale in the fridge and decided to make my favorite gluten-free sesame seed kale salad. I made my recipe whole30 approved by using apple cider vinegar instead of rice wine vinegar. And guess what? It tasted the same. I am going to have to modify the recipe now. It was SO good! 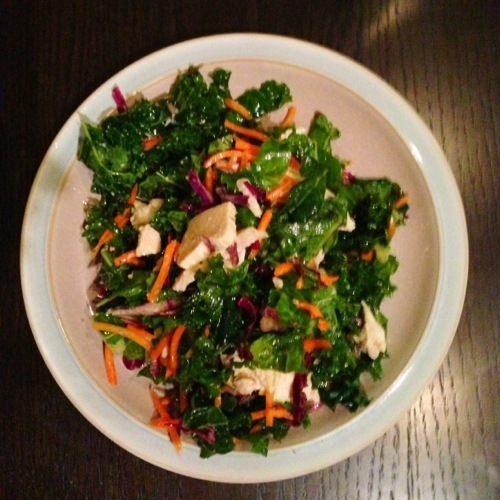 We topped the kale salad with chicken and had a perfectly healthy meal. Normally when we get home from Mammoth and are too tired to cook we just order take-out so this is a big change for me. Plus we tend to not watch what we eat as much when we are in Mammoth because we are burning so many calories snowboarding. But it felt great to stay whole30 compliant the whole weekend and was not that hard. I am proud to have gotten through a weekend of temptation and come out strong. 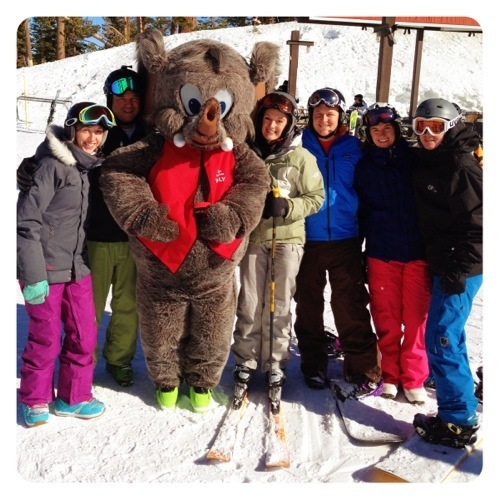 Like my friends in Mammoth told me, “If you can get through this weekend, it’s smooth sailing from here.” Happy to be on smooth sailing from here! What about you? How do you stay Whole30 Compliant on the road? Do you find it challenging? Post in the comments and let me know!